Akrapovic has launched the Akrapovic Racing Line full-exhaust system for the TVS Apache RR 310. The exhaust is available at Performance Racing Store in Mumbai, priced at INR 55,000. It is the same exhaust that is available for the BMW G 310 R and G 310 GS in the global markets. The performance exhaust system increases maximum power by 2.4 hp and peak torque by 2.7 Nm. The carbon-fibre construction has resulted in an overall weight saving of 4.6 kg on the TVS Apache RR 310. The motorcycle with the Akrapovic unit develops a 36.4 PS of maximum power and 30 Nm of peak torque. The company claims that the exhaust system doesn’t require any ECU remap on the TVS Apache RR 310. Akrapovic is known world-over for manufacturing some of the best high-end performance exhaust systems using carbon-fibre and titanium. On a side note, the stock TVS Apache RR 310 produces 34 PS of max power at 9,700 rpm and 27.3 Nm of peak torque at 7,700 rpm from its 313 cc, single-cylinder, reverse-inclined, oil-cooled motor. The engine pairs to a 6-speed gearbox. The motorcycle features disc brakes at both the ends with dual-channel ABS as standard. Suspension components include upside-down forks up front and an adjustable mono-shock at the rear. 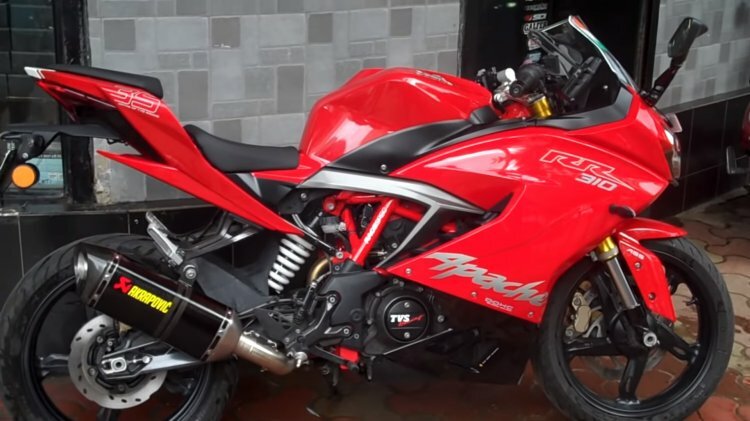 The TVS Apache RR 310 features first-in-segment Bi-LED projector headlamps, while other key features include vertically stacked fully-digital instrument console, LED taillights, daytime running lights and LED turn indicators. The motorcycle comes with a cast aluminium swingarm and 17-inch alloy wheels that run on 110-section front and 150-section rear Michelin Pilot Street tires. The Akrapovic exhaust on TVS Apache RR 310 increases maximum power by 2.4 hp and peak torque by 2.7 Nm. It costs INR 55,000. TVS Racing recently showcased the Apache RR 310 Cup race bike for the TVS One Make Championship. The race bike gets an aftermarket free flow exhaust system with modifications to its ECU and intake manifold. The Apache RR 310 Cup race model develops 4 bhp extra with the maximum power of 38 bhp.